ArtTrader Magazine: Vintage Acrylic Portraits: ATC Size! I love painting portraits and people and I love acrylic paints. And I especially love vintage photos. They are wonderful for use in collage and mixed media but also can be used as a source of fun painting reference--everything I love together in mini mail art! For these cards, I used a thick Bristol type paper and also some illustration board. 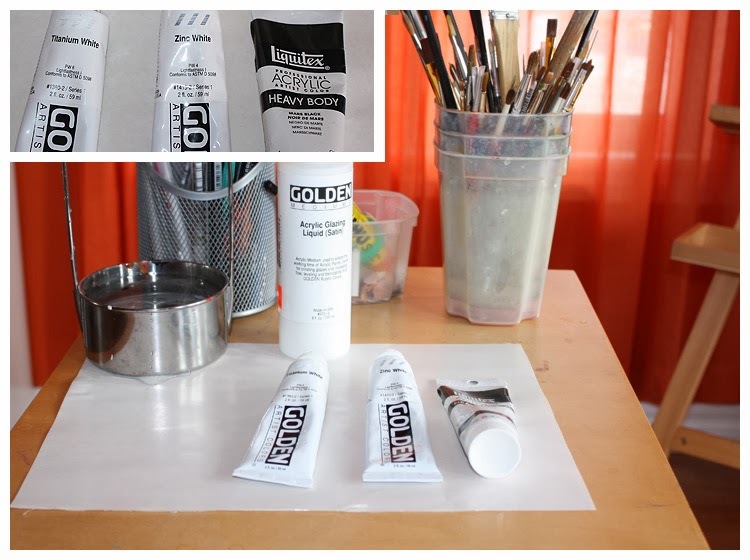 My paints are Golden and Liquitex (heavy body) brands and I used only two colors: white and black. It’s up to you which white you prefer, titanium (more opaque) or zinc (more transparent). Titanium white mixes more easily while Zinc white is better for glazing (in my opinion). Go with whatever works best for you. I used Mars Black with Titanium White and Golden’s Acrylic Glazing Liquid to thin the paints down a little and give me some extra working time. Many of the public domain photos or those on collage sheets are unknowns, simply people like us who lived their lives many years ago. If you’re like me, you’ve probably used plenty of vintage photos in your art; whether you’re cutting them up for collage or coloring them or using them as reference for your own painting. I’ve always wondered who they were, what they did for fun or for work. Luckily, in the set of photos I used here, we know (for the most part) who they were. I grabbed these photos from the Brady-Handy Collection at the Library of Congress (http://www.loc.gov/pictures/search/?st=grid&co=brhc). There are pages and pages of public domain photos. Most were politicians or generals but there are also plenty of great portraits of singers and actors. I chose Madame La Grange (occupation unknown but that name is awesome), Nellie Grant (daughter of Ulysses) and Edwin Booth, actor (and yes, that brother). What’s especially great about this collection is the very high quality digital images available. Using my photos as a reference, I paint on my undertone colors (shades) and block out shapes. I don’t draw the faces with a pencil first since I find it easier just to work our features from shapes and shadow. However, I know some people prefer to have a drawing first so do whatever is most comfortable for you. As you can see, at this point, my faces are blanks with only a bare shape. It’s all about getting color (shade) blocks in the right places. My next step is to work on tightening up face shapes, clothing lines and hair shapes too. Once I’m happy with the facial outlines, I work on lightly blocking in the features through shading and lines where appropriate. The good thing about working with wet paint is that if you make a mistake, just paint over it. If you feel like your initial shading for the eye area is wrong, you can cover it up and try again. At this stage, your painting is still loosey-goosey and easy to change. My next stage is tightening up shades, shadows and lines to make the feature and clothing sharper and more defined. Again, you can still overpaint things if you need to but most of that should have been done at the previous stage. This is your time to work on refining shape and form into nice features. My final stage is really just more of the above step: refining, defining features and then adding in highlights where appropriate such as hair, eyes, clothing, etc.